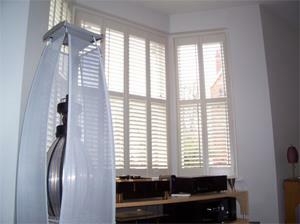 The Halifax smooth-finish shutter is the most recent addition to our comprehensive range of internal window shutters. With its smooth finish, the Halifax window (and door) shutter is Manufactured in a harder and slightly heavier wood than the Memphis softwood window Shutter. This is a Basswood window shutter with MDF frames to keep the cost down for customers insisting on wood paneled internal window shutters. 25/01/2019 - New Year Special Offer 20% Off !! !